Wow can you believe it is already Memorial Day Weekend?? Although it's the unofficial start to the Summer it's rainy and gross here in NJ so it doesn't feel very summery to me. I know lots of people will be heading down the shore this weekend or going to a BBQ to celebrate. I unfortunately will be working but hopefully the sun will be out by Monday so I can take Owen to the beach for a walk on the sand. These baked corn fritters are a healthy spring appetizer or the perfect accompaniment to some soup or a salad as a light lunch. Preheat your oven to 350 F. Spray a mini muffin pan with Pam and set aside. In a small bowl whisk together your wet ingredients (milk & eggs) along with the Parmesan cheese and chives. In a medium sized skillet over medium heat and add the oil. Saute your onions and garlic until translucent and fragrant which will take about 5 minutes. Stir frequently to be sure they don't stick or brown. In a large bowl combine the dry ingredients (flour,cornmeal, salt & pepper) with the drained and rinsed corn kernels. Once your onions and garlic have cooled add those to the bowl as well as the wet ingredients. Stir everything until just combined. Spoon the mixture into the mini muffin tray and bake for 20 minutes. Allow to cool in the pan for a few minutes. Serve immediately topped with chives and Parmesan cheese. I found that these are better when eaten warm and right after they are baked. They got hard and dense when they were reheated. PINNED! 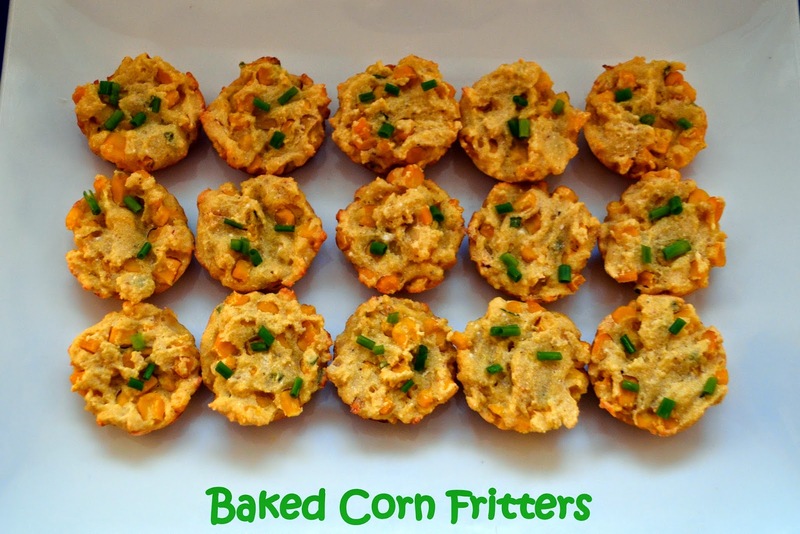 We love recipes with corn meal in our family and these are perfect! Bite sized and great for on the go! minus the onion and these will be totally fab! love corn fritters but never actually made my own, your recipe sounds doable :) Pinned!